If J.A. Henckels has a good reputation among the professionals and better-off cooks, Chicago Cutlery enjoys great reviews from experienced home cooks who want knife block sets of good values. The brand offers a wide range of block sets, from 11 to 21-piece sets of different lines. After days of research, I’ve shorten my list of the best down to 3. These are chosen on the criteria of material, quality, price, and more than a thousand buyers’ reviews and feedbacks. As you can see, the three Chicago Cutlery sets all include forged knives, which translates into the best stability and durability. Each of them come with wood block, and a pair of shears. The 18-piece set has a built-in sharpener while the other two come with a sharpening steel each. Note that the block, the sharpening steel, and the shears each counts as one item in the set. Apparently, the Chicago Cutlery 18-piece Insignia Block Set, the best in this collection, includes all the important knives for cutting work in the kitchen. However, having a bigger item count doesn’t always mean being more complete. The 13-piece set actually has more utility knives than the 16, including an important hollow edge santoku. Compare what’s in each set carefully and consider your cutlery needs before making the final decision! If you want your money well spent, spend it on this set of knife. If you’re aware of the uses of each knife, you will see that this is Chicago Cutlery knife set is a pretty complete one. It includes all the important knives for cutting meat, fish, poultry, and veggies, covering all the usual cutting tasks in the kitchen. And not only that, but also a full set of 8 steak knives – sufficient for a family gathering. The wood block deserves a compliment here. I think it looks very neat and handsome! Handle: All of the knives in this set, except the shears, come with a stainless steel handle. As you can tell from the picture, it’s very ergonomic and the grip feels so natural! For extra balance, the handles of the smaller knives are made hollow. With a plastic handle, the shears do look a little out of place, but they’re decent for basic cutting nevertheless. One thing though: don’t try to use these knives if your hands are oily from the food. Metal handles tend to slip much more easily compared to plastic or wood handles. Weight and balance: As forged knives, these feel quite weighted in your hands. Balance is excellent, with a super bolster in the middle of each knife. Durability: Forged out of single slabs of high carbon stainless steel, all of the knives in this Chicago Cutlery Fusion block set are thick, solid, and durable. Sharpness: The knives in this set come almost too sharp at the beginning, being made with Chicago Cutlery’s exclusive Taper Grind edge technology. They can give a clear cut through a tomato with almost no force. However, they can become dull quite fast with frequent use. That’s why they come with the built-in sharpener in the block. Make use of the sharpener to hone your knives once or twice a week, and get them professionally sharpened once a year. If you don’t like the built in sharpener (I didn’t), hone them with a sharpening steel. Note that the steak knives in this set are not serrated. They keep their edge very well, but you may need to do the honing more often, maybe before every use. Cleaning: With the handles and the blades connected seamlessly into one smooth piece of metal, cleaning is a piece of cake. Wash them with a piece of cloth and mild soap right after use, and dry them immediately. Never, never ever put them into a dishwasher. The banging will definitely destroy the knives! Verdict: With all the important knives for various cutting jobs in the kitchen, this is a very complete knife set offered by Chicago Cutlery. Solid, sharp, durable, and easy to clean, they’re the perfect choice for a cook who want middle ground quality knives for their home kitchen. Another great-for-the-value 18-piece set that you must have heard of is the Chicago Cutlery Fusion Block Set. Check it out! Handle: This Chicago Cutlery knife set belongs to the DesignPro line, and it bears that name for a reason. All of the knives, apart from the steak knives, come in a very special design at the handle. In place of a bolster as you usually see on a forged knife, there’s a concave part at the center of the knife. It guides your fingers to the most comfortable and efficient grip. This translates into better control and enhanced precision when you’re doing the cutting work. The rest of the handle is a combination of the full metal tang and plastic parts that makes it very comfortable to grasp. And super stylish and easy on the eye too, if you ask me. The steak knives, meanwhile, come as one single solid piece of metal each. Stainless steel handle and blade, beautifully and seamlessly connected. Weight and balance: These knives are nicely weighted, as typical of all forged knives, and the balance is great. With effortless control from the smart grip, you can use these knives for hours without fatigue. Durability: Forged out of high quality Japanese steel, the blades are strong and resistant of stain, discoloration and rust. Each coming with full tang, the chance of them breaking at the handle is extremely low. These knives are made to last a lifetime with proper care. The Chicago Cutlery DesignPro knives in this set come razor sharp. They’re easy to re-sharpen too, apart from the serrated ones, which never need sharpening anyway. If you’re a fan of serrated steak knives, you will love the ones that come with this set. For one thing, they’re super super sharp! The cut is almost effortless. They have a sleek elegant look too, which helps. Cleaning: Easy, as the design is simple and the plastic part are connected into the tang seamlessly, leaving no space for dirt or food particles to get in. Like with all other knives, it is not recommended to put these knives into the dishwasher. They may bang against other objects in the machine, which can cause serious damages to the thin edges. Also, the strong soap can discolor and harm the plastic handle. Verdict: With high quality material and a smart design, the Chicago Cutlery DesignPro knife set can bring about precision in the cuts and minimize the user’s efforts. 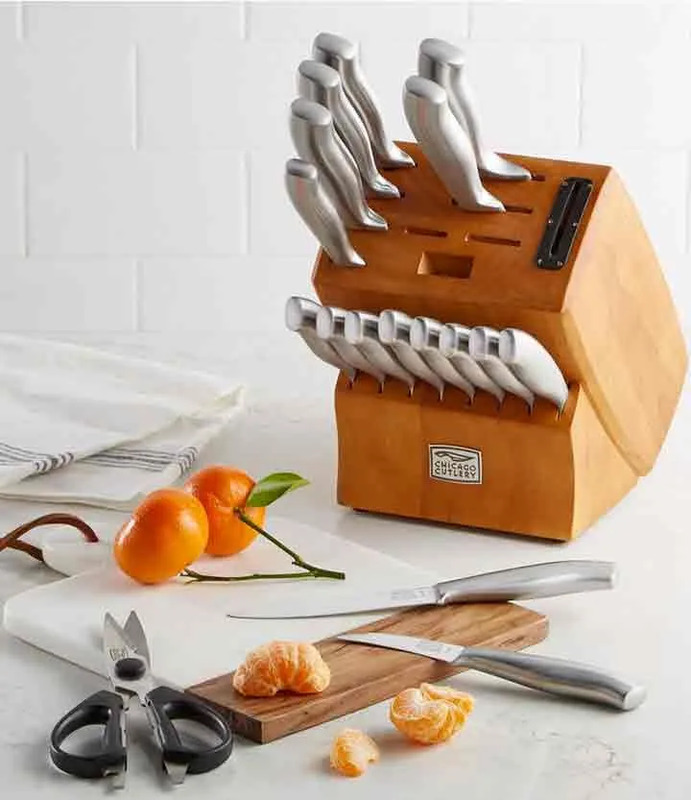 This knife set would make the perfect gift for a dedicated cook who spends lots of time doing prep work in the kitchen every day. I honestly don’t understand why there are two paring knives – with the same size and design! Still, this is a decent knife set, and you really can’t beat the price for this quality. Handle: Designed ergonomically, these handles are very comfortable to the hold. They are hollow, and thus are not as weighted as you may imagine. Connected to the blade as one piece, you never have to worry about them getting loose or broken. Again, though, don’t use the knives with greasy hands. The handles are smooth and you may slip and cut yourself. Weight and balance: These forged knives are not the lightest in the world, but they are not too heavy weighted either, with hollow handles. They’re well balanced with a bolster between the handle and the blade. Durability: As typical of forged knives, all of the knives in the Chicago Cutlery Elston set have thick, hard blades. They’re made of high-carbon stainless steel, which makes them even stronger. With basic maintenance, they can hold their edge and their shape for years. Sharpness: These come out of the box surgically sharp, with Chicago Cutlery’s unique 25 Degree Taper Grind® applied on their edge. Precision is guaranteed – these sharp knives can help you perform the finest dice with ease. If you’re diligent, use the sharpening steel to hone them, especially the non-serrated steak knives, before every use. That significantly improves their sharpness. Once every 2 or 3 times of use is sufficient though. The knives will also need serious sharpening once or twice a year. Cleaning: The Elston knife set is one of the easiest to clean, as it is one solid piece of metal from the blade to the handle. You never have to worry about food particles getting stuck in the space between the tang and the handle – there’s no such space. Don’t make the mistake of putting them into the dishwasher though. That’s a guaranteed to give them chips and rust. Handwash and dry them with a cloth immediately after use and they will stay free of spots and rust for a lifetime. Verdict: The Chicago Cutlery Elston may not be the best knife set for a professional, as it has only 4 types of knives for prepping (chef’s, utility, bread knife, and parer). However, those knives are sufficient for casual cutting work in the kitchen, and would make a great kit for the starter home cook on a budget. I’ve had for many years a full set of CC knives, all with walnut grips. At the time I bought them (maybe 30-40 years ago) I thought them the best set of kitchen knives available. They take a great edge and with a few stokes of a CC steel return themselves to a near-razor sharpness. Can’t speak for the newer models, but my set will go to my kids. Thanks for stopping by, John! Chicago Cutlery knives are indeed well-known for their durability, but to remain razor sharp and strong after 30-40 years, I believe you have treated them well!